Women have made great strides in the workplace over the past few generations, but one thing remains the same: those serving at the very top of our municipalities are overwhelmingly male. According to the International City/County Management Association, the number of women serving as city/local government managers has barely moved in three decades: in 2014, just 14.4% of the nation’s municipal managers are women. The story is the same in Michigan: women make up only 16% of those serving in the municipal top spot. The argument for women goes further than gender balance: putting more women in the executive seat is better for our communities. Gender diversity and women in leadership positions help government organizations reach higher levels of success – and governments are more effective when they better mirror the populations they serve. Highly qualified women entering the field encounter barriers in the selection process. The next generation of women leaders is being left untapped. Aspiring managers are eager for development opportunities to advance and prepare them to take on the municipal executive roles. Together with our work group, the League constructed the 16/50 Project initiatives to be both robust and meaningful in our effort to increase the representation of women in the municipal management profession. Over six months later, we’re checking in. Here’s how we’re tackling gender diversity in local government and what we’ve got our sights set on next. In partnership with the Ford School for Public Policy at the University of Michigan, we set out to tackle one of the goals of the project: developing tomorrow’s women managers. The interactive panel session, titled Women Leading Local Government, was held on October 19 and featured four women currently serving as municipal managers in Michigan: Sheryl Mitchell, city administrator for the City of Lathrup Village; Deborah Stuart, city administrator for the City of Mason; April Lynch, Ferndale city manager; and Torrie McAfee, township superintendent for Buena Vista Charter Township. The more than 70 students in attendance heard about each speakers’ path to municipal management and were presented with real-life local government challenges to work through – which included everything from how to handle audience participation in meetings to working with developers on projects. 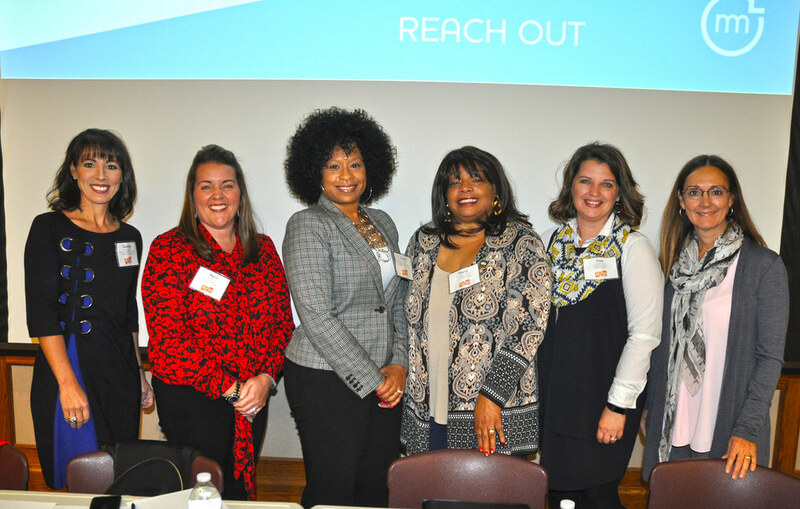 Women Leading Local Government sessions will continue around the state to expand the 16/50 Project’s reach and encourage more students in Michigan to enter the field. Next up: Grand Valley State University later this fall. Twenty-five women were selected to participate in the first Women’s Municipal Leadership Program: they’re clerks, department heads, finance directors, planners, police chiefs, etc., each with dynamic and impressive experience – and they’re ready to take the next step toward the executive office. You can read more and meet the full WMLP Class of 2018 here. To help them on their path to becoming strong local managers, the WMLP class met in August, September, and October, covering the critical topics of municipal finance, municipal budgeting, and economic development. We’ll convene again next month for the final session to zero in on council-manager relations. Each month has included a leadership development component; the October and November sessions also include panel discussions to allow our participants to interact with current municipal managers. By structuring the program in this way with content, tools, and opportunities that help serve women’s specific needs, we feel the 16/50 Project is on the right path to developing strong local managers – and strong local communities. We’re working to train elected officials on their piece of the puzzle through the League’s Elected Officials Academy: now included in the EOA Advanced Weekender rotating agenda is targeted diversity and inclusivity training for elected officials with specific information on gender balance. We’ve kicked off 16/50 Ambassador Program, connecting students and professional women interested in local government management directly with women currently serving as municipal executives. Our ambassadors serve as a point of contact, share resources, and provide insight on the profession to women from all career stages. We’re highlighting the 16% through 16/50’s Executive Profiles. You can’t be what you can’t see: by bringing the women leading local government in Michigan to the forefront, we’re providing other women role models to follow and showcasing the work that women do as chief executives in our municipalities. While incredibly energized by the 16/50 Project’s mission and progress, there’s still work to be done. Stay tuned as we continue to add resources, meaningful training opportunities, and other programming that help more women secure the top job to lead Michigan’s communities forward. Emily Kieliszewski serves as the League’s Membership Engagement Specialist. In this role, Emily strategically coordinates with all areas of the League to connect members with resources they need; enhances member engagement through the execution of various outreach, programs, and events; and maintains strong relationships with League members. Emily manages the 16/50 Project and is also the host of the League’s Limelight podcast. © Michigan Municipal League. All rights reserved.